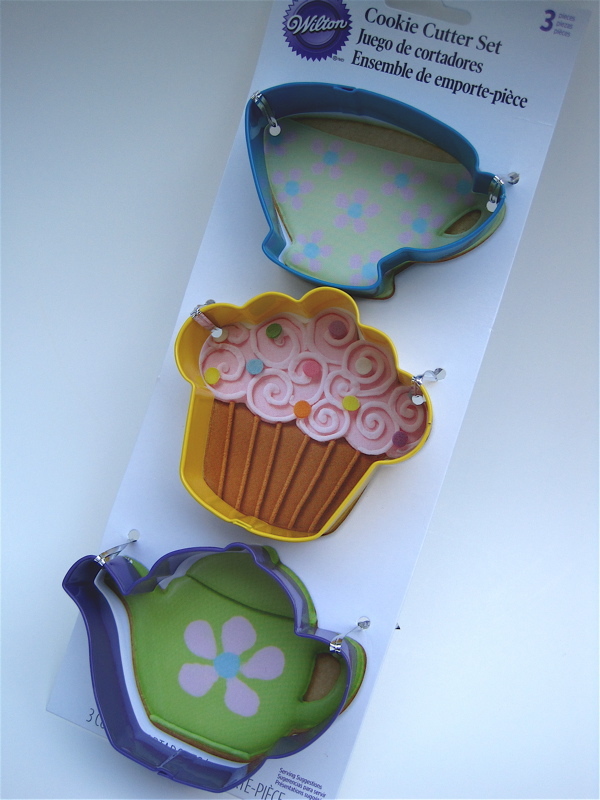 Last week at Michaels I discovered a new set of cookie cutters that may be of interest to my fellow tea lovers! While I do already own some teapot and teacup cookie cutters, they aren't the exact shape and size of these, so for $3.99 I thought this set would be a useful addition to my cookie cutter collection. 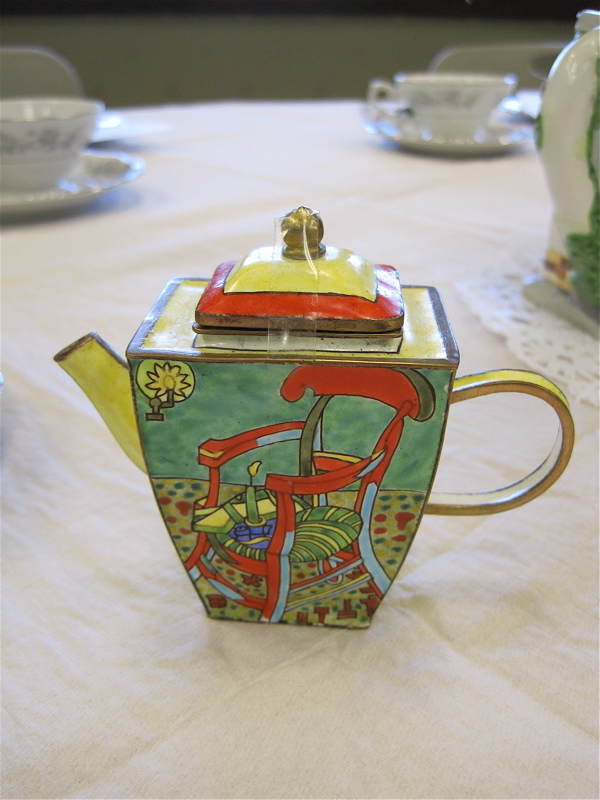 The teapot is about 3-3/4 inches wide by 3 inches tall. 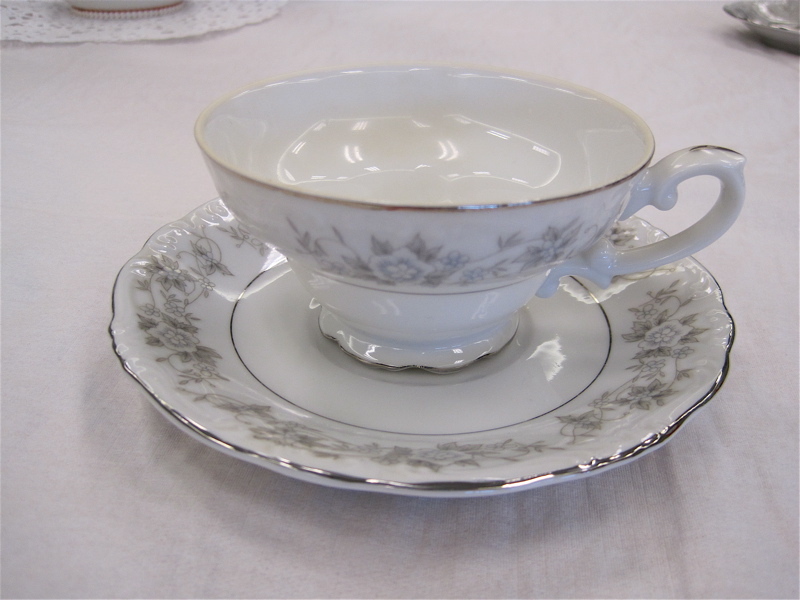 The teacup is about 3-1/2 inches wide by 2-1/2 inches tall. 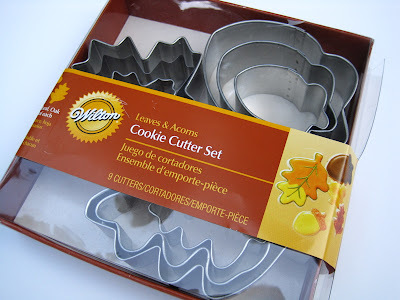 Michaels is also where I found the leaf-shaped cookie cutters I used for last week's tea sandwiches ($5.99 for the set of 9). So if any of you need new cookie cutters, the selection seems to be especially good right now that we're all starting to think about the holidays. 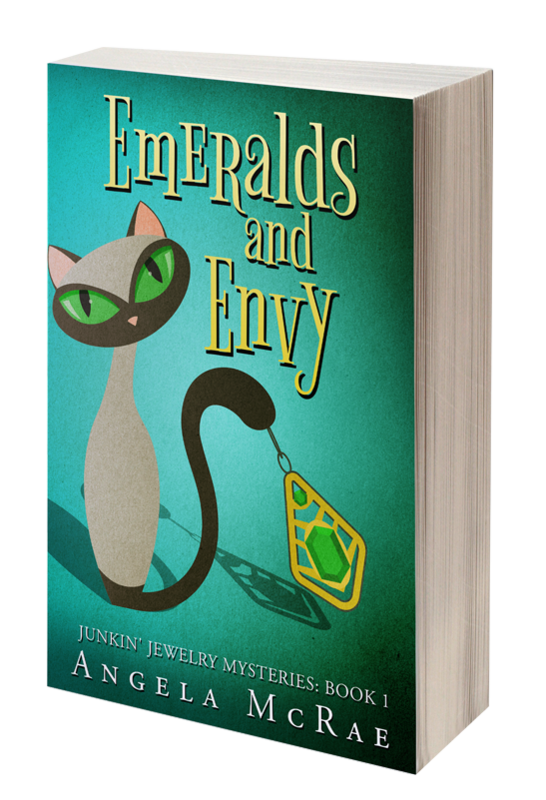 AND COMING MONDAY ... I have a big announcement to make! I've been working on a major project I hope some of you will be interested in, and on Monday I'll share the details with you! 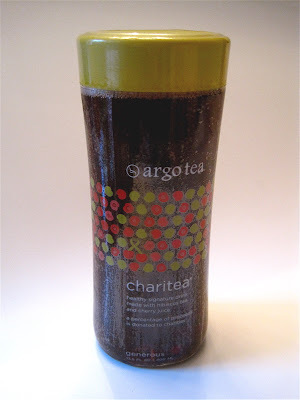 Have a cup (or bottle) of Charitea! I'm a sucker for unique packaging and a clever name. This bottled tea I found at Whole Foods succeeded on both counts and came home with me. I think the elegant oval shape of the glass bottle is what sealed the deal! 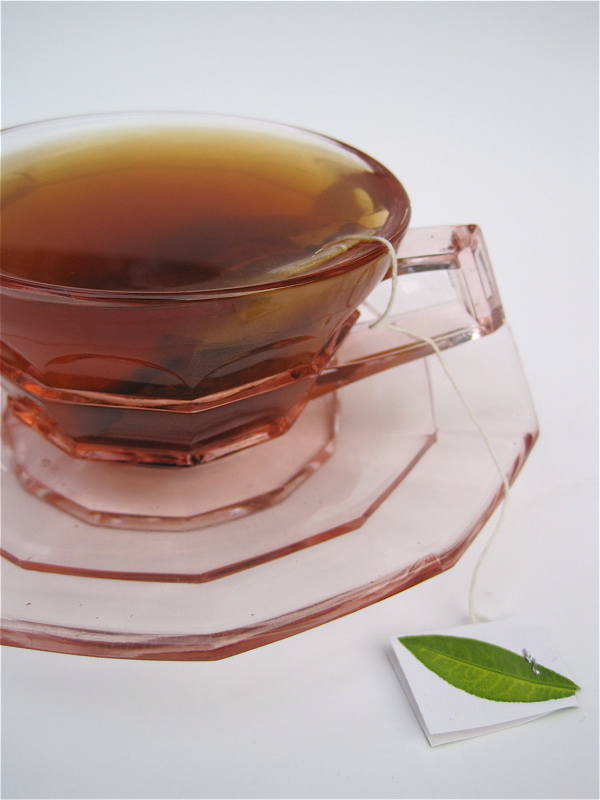 Argo Tea is a name I'd not heard before (have any of you? 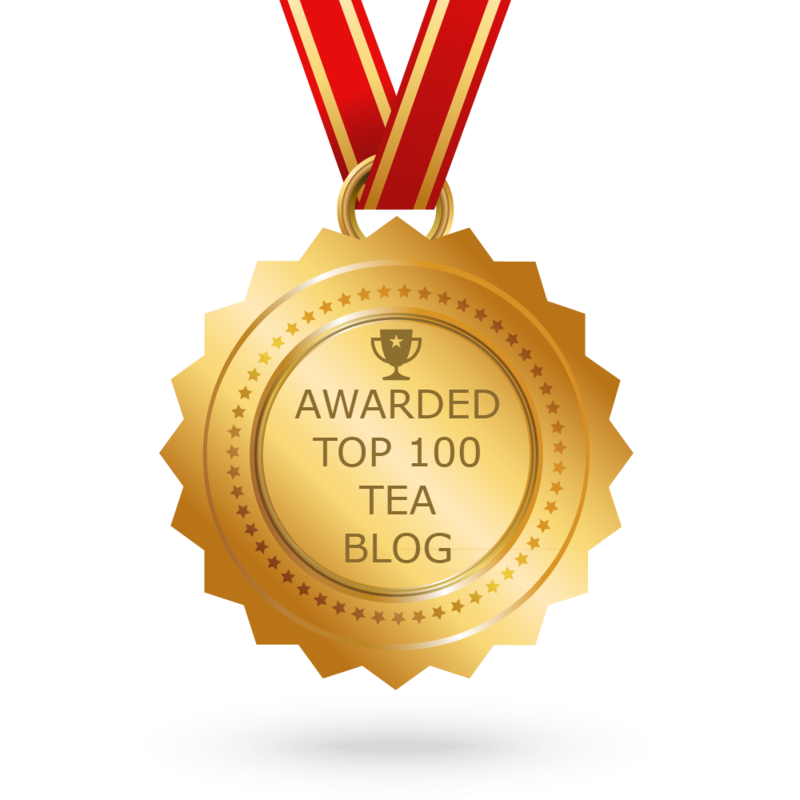 ), and I definitely think it needs to be on my tea radar. 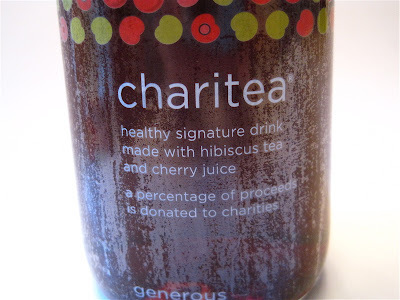 This Charitea blend is flavored with hibiscus flowers, red cherries and vanilla. The flavor is tart but not too tart, and I was impressed that the hibiscus, cherry and vanilla flavors are all there, yet so intertwined you wouldn't notice it unless you were thinking (or blogging!) about the flavors. The company says it supports organizations which champion women, wellness, the environment and the arts. I scanned the list of some of their recent efforts and was impressed with their work. It's actually one of the more interesting tea company websites I've seen in a while, and you can find it at argotea.com. I've had a few questions over the past few days which I thought I would address here so everyone will see the answers! * Where did I find the teapot flash drive? 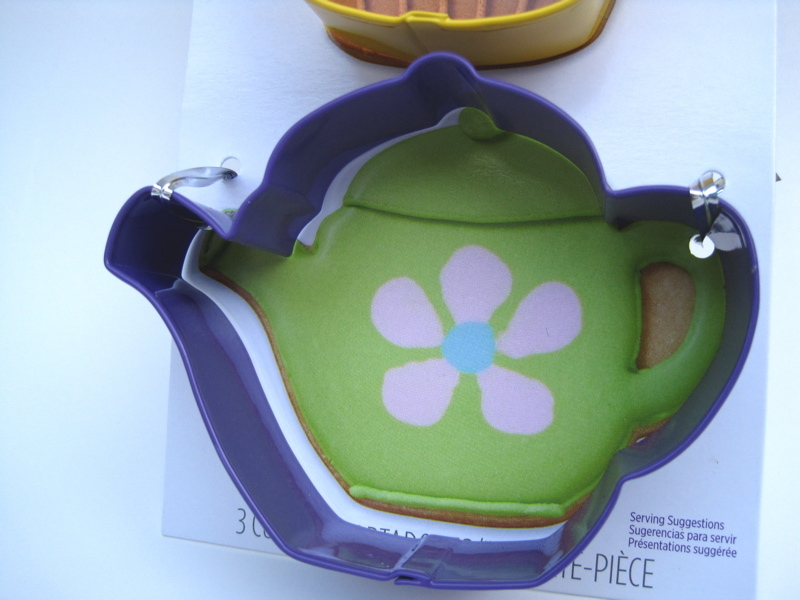 eBay, and if you search for "teapot" and either "USB" or "flash drive" you should find them. I ordered mine from Hong Kong for 89 cents plus $7.50 shipping. I definitely took a gamble on this (I do not like to order from Hong Kong! ), but it works great and I have already transferred some files to a friend using this flash drive. We agreed it would be great for espionage! 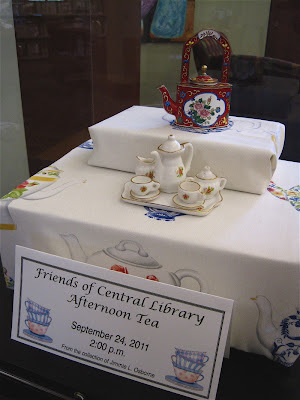 * How long will the Central Library's teawares be on display? Through Thanksgiving, the library director says, so you still have plenty of time to stop by if you live in the area. 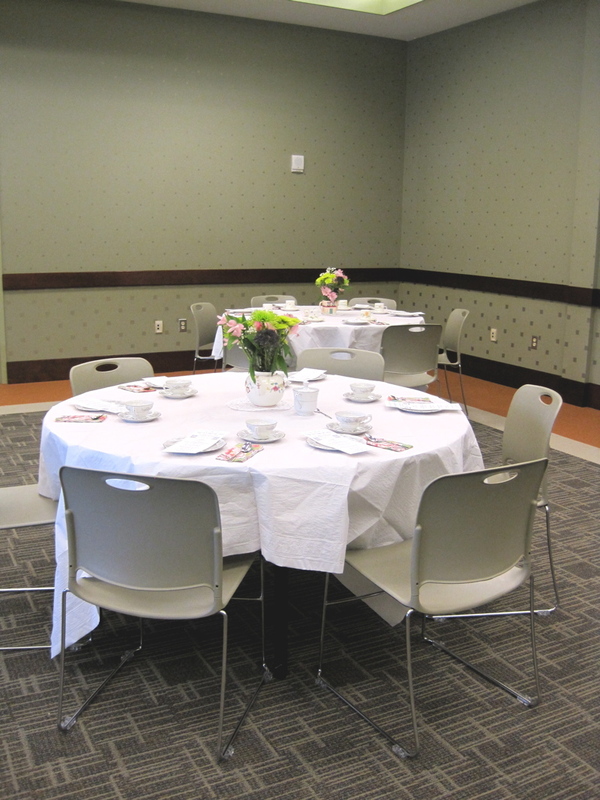 * Where did I get the tea-themed outfit I wore at the library tea? eBay, again. It was still new with tags, and it originally came from QVC. The label says "Quacker Factory," if that helps. (If you're at all interested in tea-themed clothes, do a search online for "Michael Simon" and a word such as tea, teacup or teapot. I have a Michael Simon knit dress with teacups on it which I haven't even worn yet (need to lose a few more pounds!) but hope to wear later this fall. 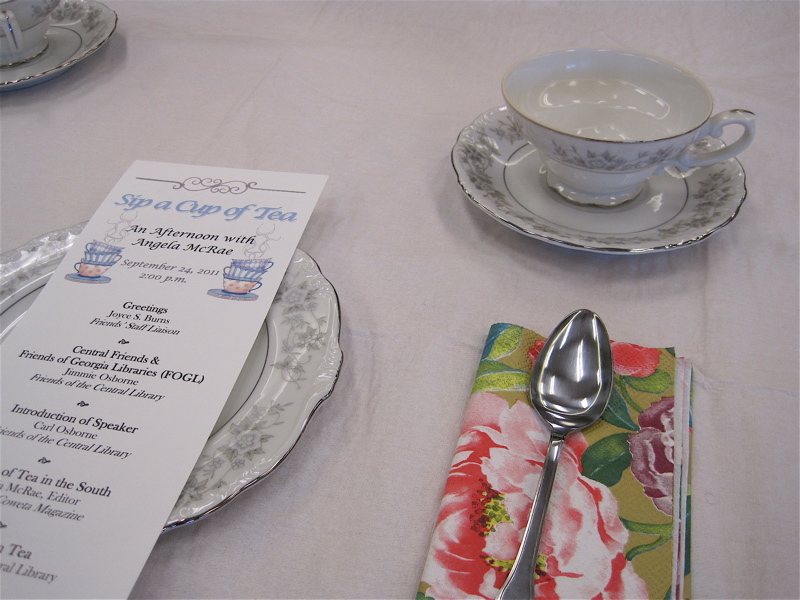 And now, since a couple of you were interested in what I talked about, I'd thought I'd go right to the heart of the "History of Tea in the South" part of my library talk! 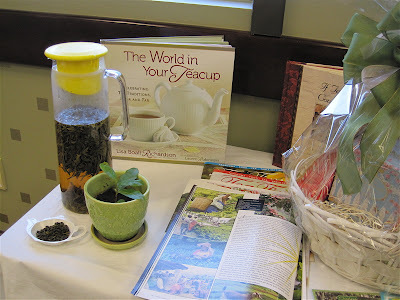 I had taken along the camellia sinensis plant I rooted for my friend Deberah from the one given to me by my friend Lynn, and I asked if anyone had ever seen a live tea plant. They had not, so I was happy they would all be seeing something new! After a brief description of the difference in processing of green, black and oolong teas, I shared about my 2008 trip to the Charleston Tea Plantation, and of watching the Green Giant as it harvested the tea. The Charleston Tea Plantation was started back in the 1960s on an old potato farm. 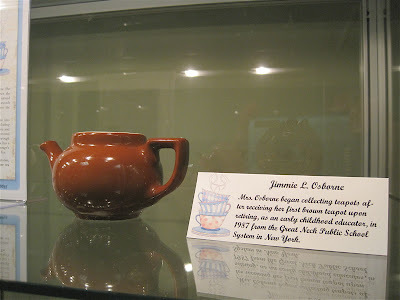 When I got home from that trip, I began to search online for more information about early tea production in South Carolina. 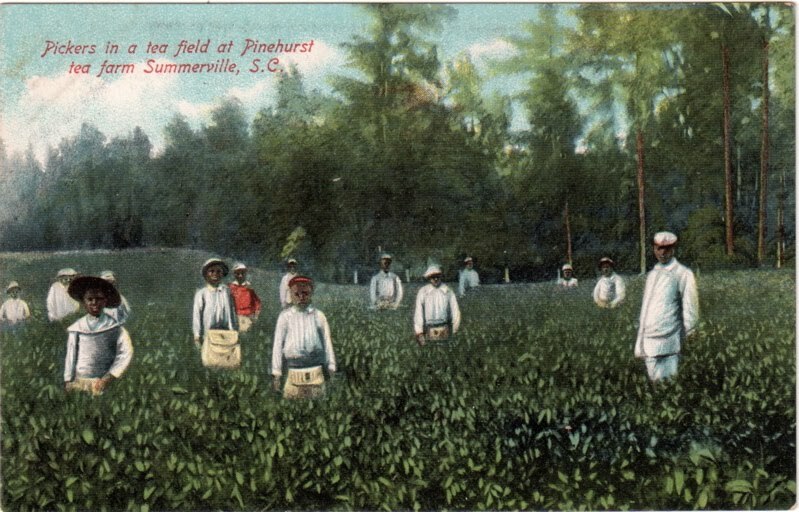 Turns out, a Dr. Charles Shepard had actually planted tea in Summerville, S.C. back in the late 1800s, and tea plants from that abandoned operation were transplanted to the Charleston Tea Plantation. 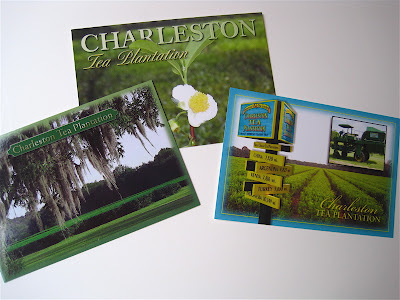 I found several vintage postcards from his Pinehurst Tea Gardens which you can see here and here. One day I came across a Pinehurst postcard with an image that puzzled me, this one. They're described as "pickers in a tea field," but of course an image of young black men picking anything in a field wasn't exactly a cheerful image in my mind. I kept wondering how these youth became tea pickers, and so the postcard actually gave me more questions than answers. 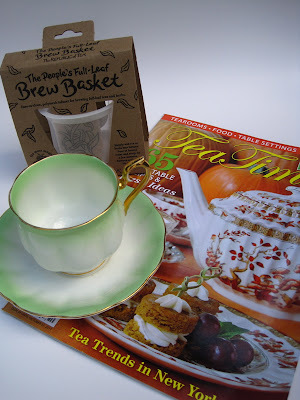 Then one day, tea blogger "Tea Lover Denise" in South Carolina, who was moving to England, was giving away some of her things in preparation for the big move when she came across an old article she thought I'd like. Did I ever! 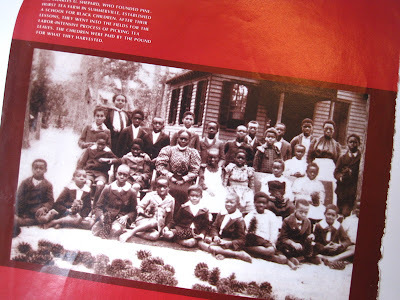 It turns out that Charles Shepard had started a school for these young people (shown above), which certainly added a new element to the history of tea growing here in the South. According to the article, which appeared in a Charleston building industry publication, "After their lessons, they went into the fields for the labor-intensive process of picking tea leaves. The children were paid by the pound for what they harvested." As I told the library group, I really don't know much more about them than that, but I plan to make a trip to Summerville, S.C. and visit their museum so I can learn more about Pinehurst and those who worked there. It's a topic I find endlessly fascinating, and if you can add to the story please do! ... and this one. These and many of the other teapots on display belong to a lovely lady who also happens to be the mother of our county library director! 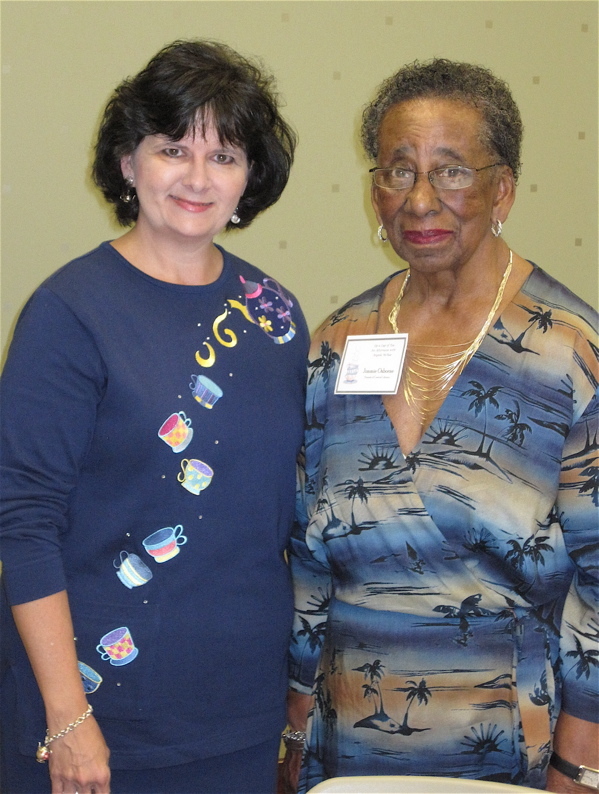 I first met Mrs. Osborne several years ago when her church in Newnan had a speaker on the topic of tea and someone thought to invite me. I quickly discovered we had a mutual interest, and this was either the third or fourth time I have enjoyed being at an event with her! 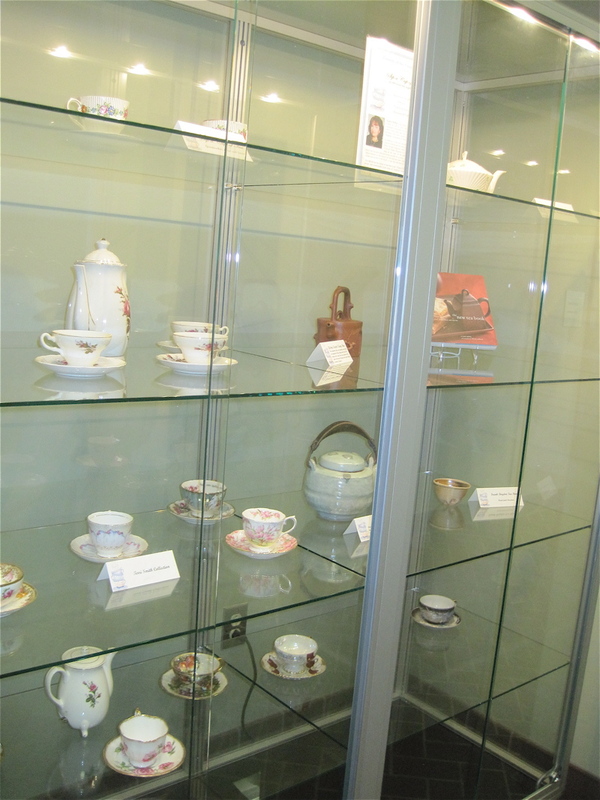 This display case featured some of her teawares on loan to the library. 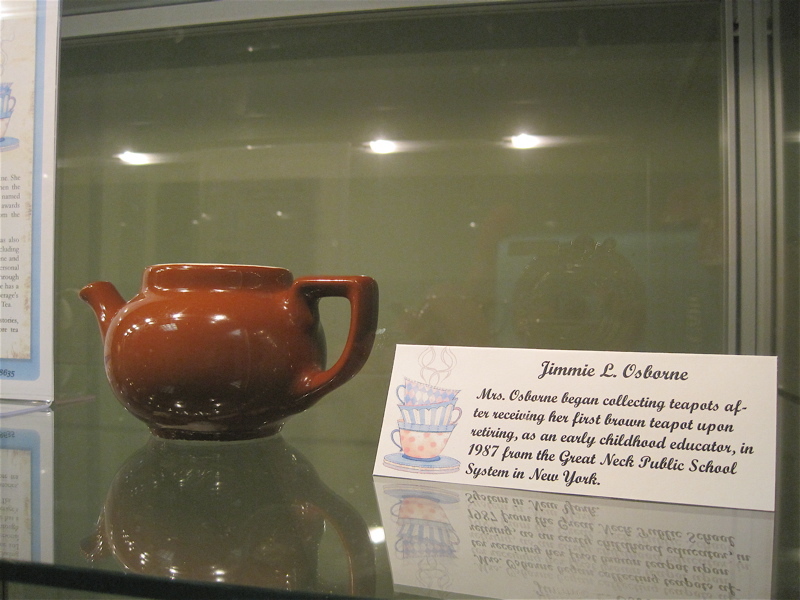 A sentimental favorite is this brown teapot which she received as a gift after retiring as a New York public school teacher. One of her favorite teapots is this tiny Van Gogh teapot from the Van Gogh Museum in Amsterdam. Her white elephant teapot at left came from South Africa. 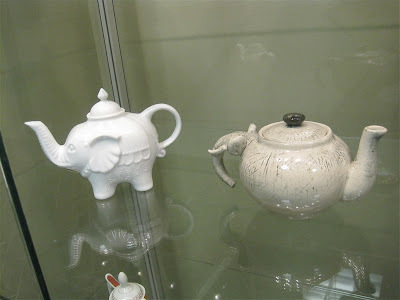 And I've never seen an elephant handle like the one on the teapot at right! 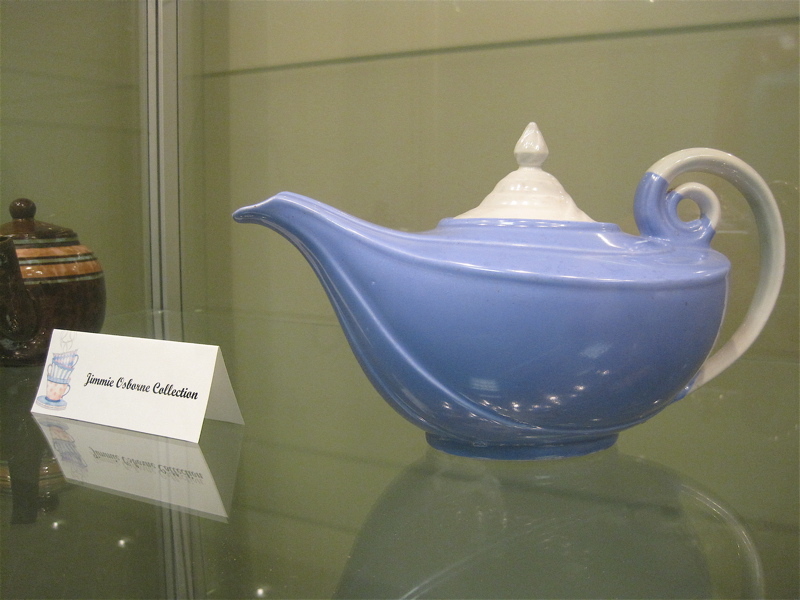 She also has one of the famous Aladdin teapots. 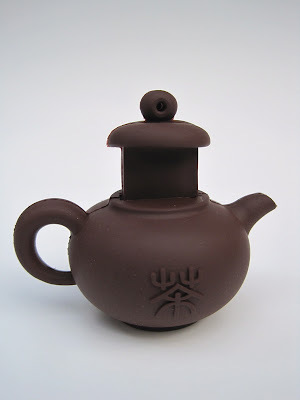 That model has long been on my teapot wish list! Another case was filled with wonderful teawares as well. I was trying to snap as much as I could when I realized it was almost time for me to speak! Some of these teawares belong to a friendly woman (and library supporter) named Terri, and I learned she and I attended college together at the same time, although in different fields of study. 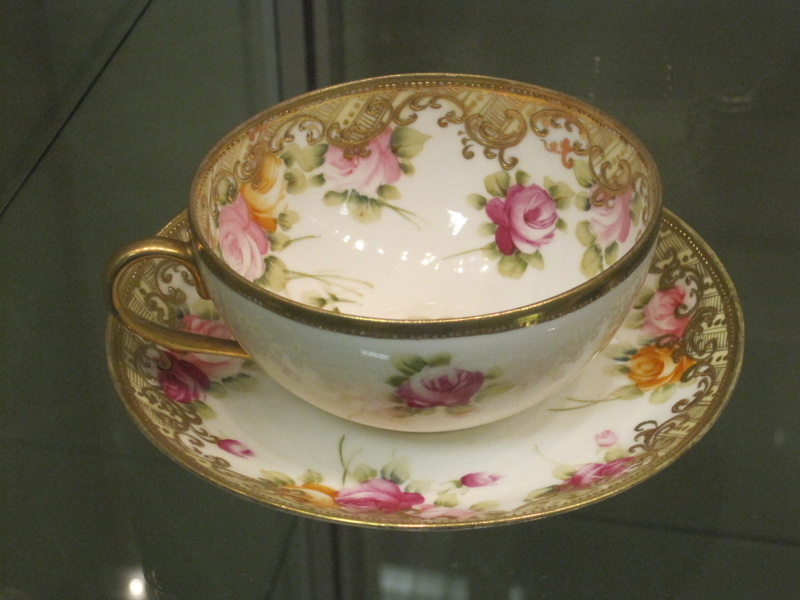 This highly gilded teacup is gorgeous, isn't it! 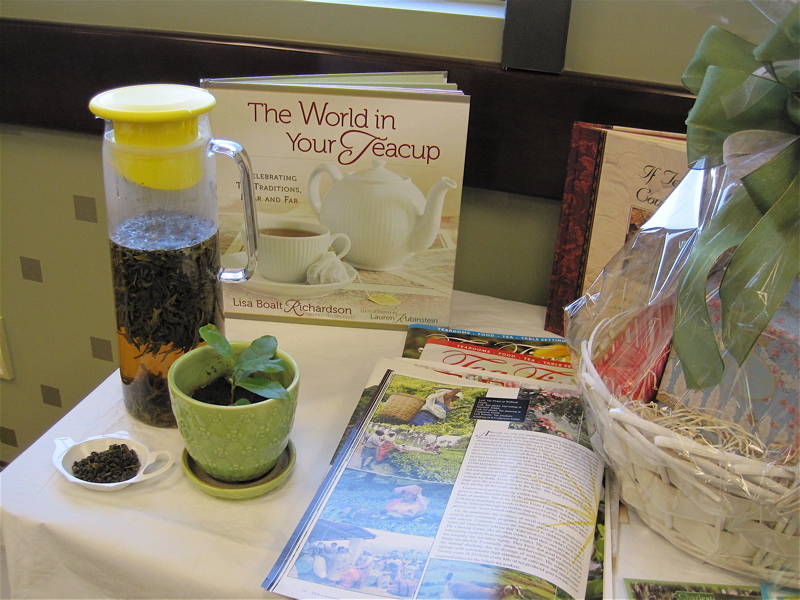 And after enjoying an afternoon of tea and getting to see all these great teawares, and receiving a lovely bouquet of flowers, I also received a gift bag containing the goodies shown here! 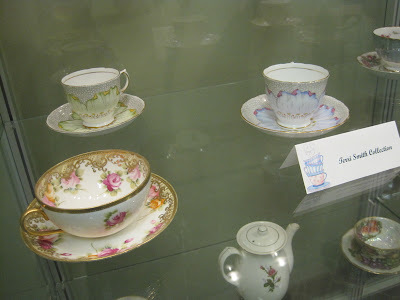 The elegant green teacup and saucer is by Royal Albert and is marked "Rainbow." I've never seen this design before and immediately loved it! What a treat to receive a vintage teacup, along with a new brew basket and the latest issue of Tea Time. I will definitely have fond memories of this fun fall afternoon! 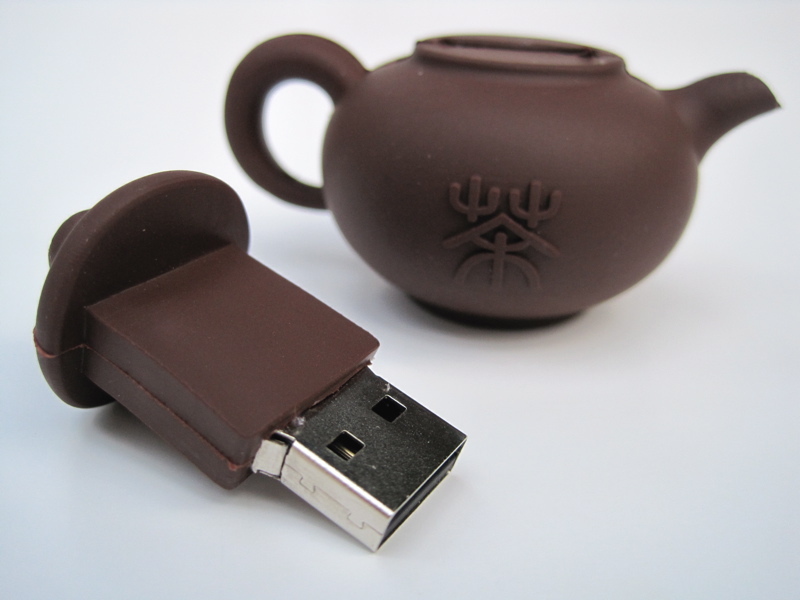 Those who guessed this teapot is a flash drive were correct! But ... you didn't have to guess correctly to win, you just had to make a guess, and the random number generator picked Ginger, who had guessed this was a cat toy. Thanks for guessing, and congrats to Ginger, who now has a Starbucks gift card headed her way! Afternoon tea for a good cause! 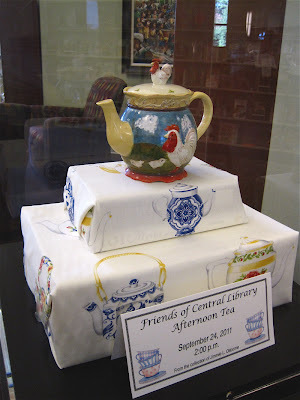 Several months ago, I was asked to speak at a Friends of the Central Library tea here in Newnan. On Saturday, a dear lady at my table kindly gave me her invitation to go in my teatime memory box. I thought this was just a beautiful invitation and was so happy to receive it! 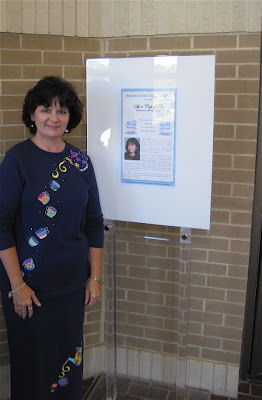 Here I am in the library entrance with a sign advertising the event. And I have to tell you we have really, really nice libraries in my community, and have in fact been building new ones at the rate of one every two years. 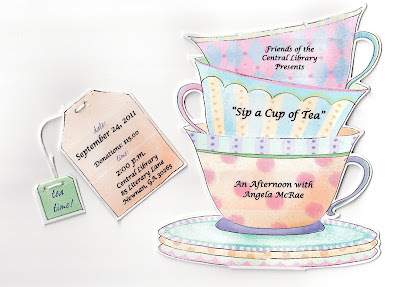 "Friends of the Library" groups are sort of a new thing for us, though, and much as I love books I was happy to support this event. Here's the pretty teacup that was mine for the afternoon. We had a simple black tea but it was quite good and I drank lots of it, thanks to the very attentive hostesses on hand! 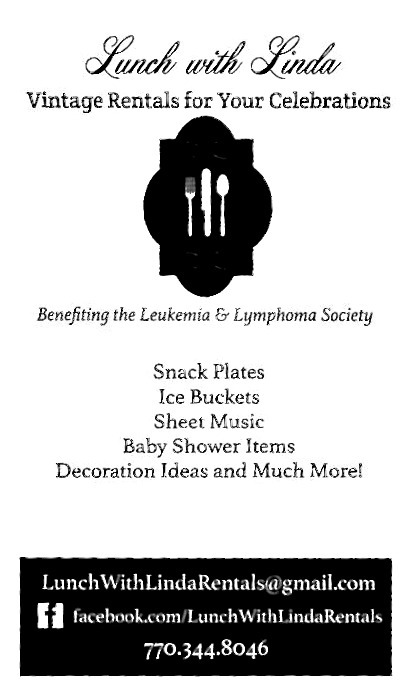 Here's the table setting with a program at each spot. 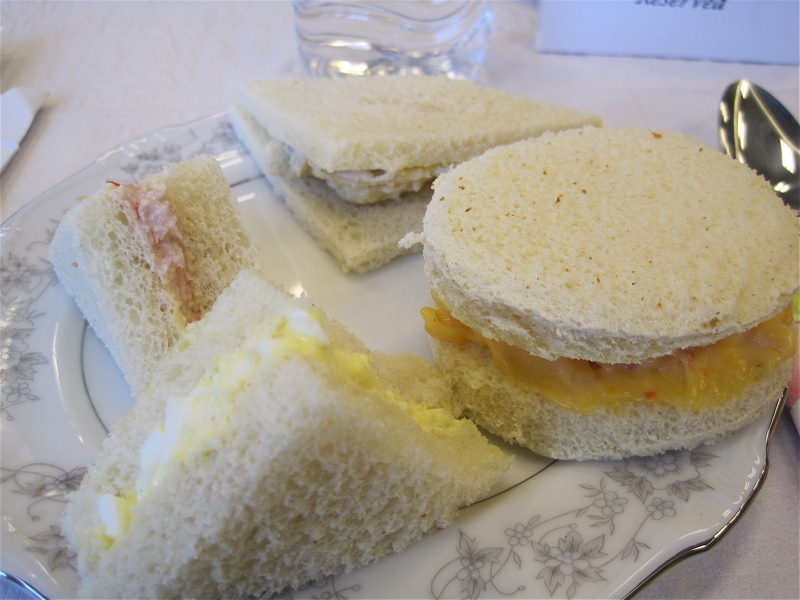 These are four of my five tea sandwiches (I didn't realize there was yet another tray to come when I snapped this photo). We had pimiento cheese, egg salad, ham salad, chicken salad and tuna salad. 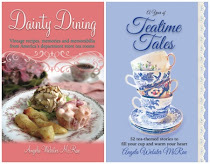 I must say the fillings were all quite delicious, and I was very glad I had skipped lunch! And of course it wouldn't be a tea without sweets. We had lemon cookies, chocolate truffles, brownies and banana bread, and for once I didn't have a clear favorite because I liked them all. 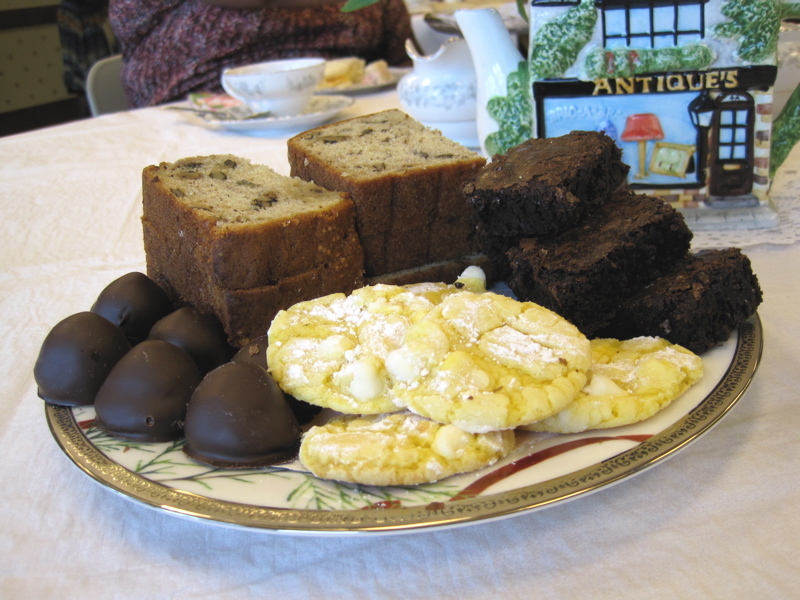 The cookies were very lemony with a great texture, the truffles were melt-in-your-mouth good and smooth, the banana bread was that nice texture I love (mine's always good but too flimsy for attractive slicing) and fudge brownies that were just right. Needless to say I didn't require very much supper that night! 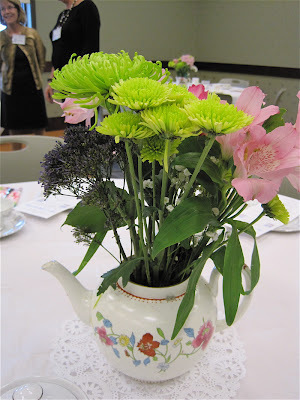 I had been to a library tea before and it wasn't this formal, so I was surprised to walk in and find round tables covered in tablecloths and decorated with teapots and teawares. Lovely! They had even arranged flowers in all the teapots, and I got to take a bouquet home with me. 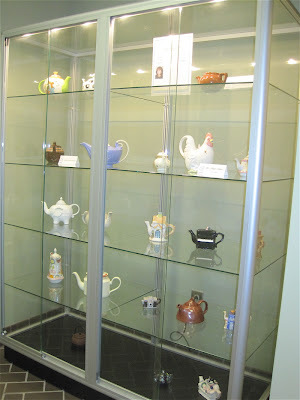 And if you'll come back tomorrow, I'll show you some of the library's display cases filled with some very special teapots and teacups so that you can lust over them just as I did! Hello, fall! This week's tea sandwich was inspired by the arrival of fall and by a timely visit to Sweetology's blog post here. 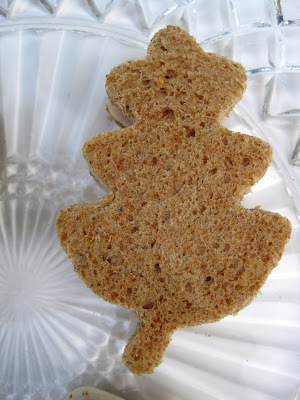 I think her acorn tea sandwiches are adorable! Everything she makes or bakes looks absolutely perfect, and yet I like her anyway! Pecan brown butter is the secret to this tea sandwich's rich goodness. First, I started with leaf-shaped cutouts of Pepperidge Farm Very Thin Whole Wheat Bread and then topped them with slices of Maple-glazed Turkey and white American cheese from the deli. 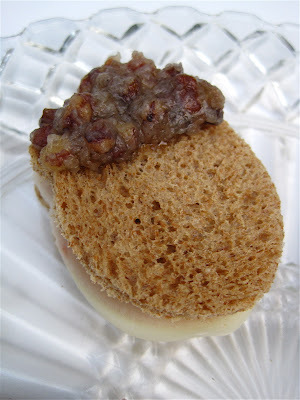 Then I spread a tiny bit of the pecan butter and the other slice of bread. 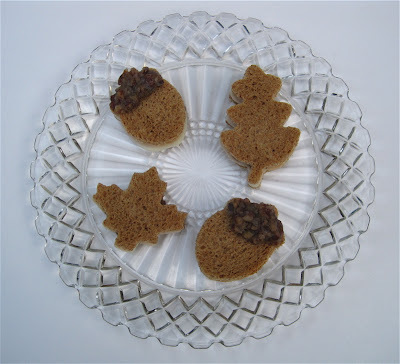 It's a very "fall" tasting sandwich, and boy did I love it! For the acorn sandwich, you can add a "cap" by spreading a tiny amount of the brown butter to the top. Now I always tend to change a few ingredients based on what sort of mood I'm in. Trisha made her brown butter with butter, pecans and honey. I opted for maple syrup instead of the honey, so here's the recipe. 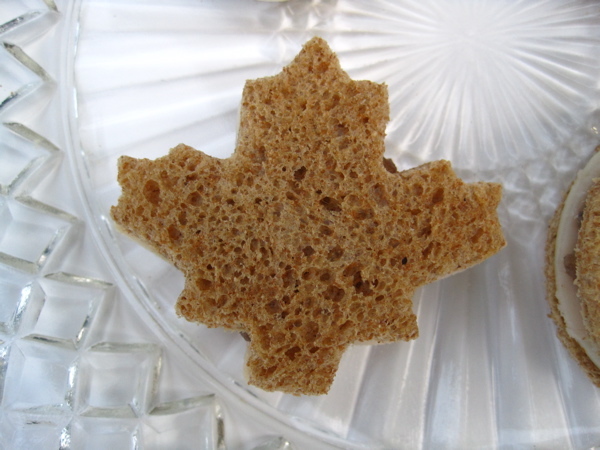 In small saucepan, melt butter over medium heat and cook until butter begins to brown and has a nutty aroma, about 6-8 minutes. Remove from heat, strain and let sit at room temperature until set, about an hour. Add pecans and maple syrup and combine. 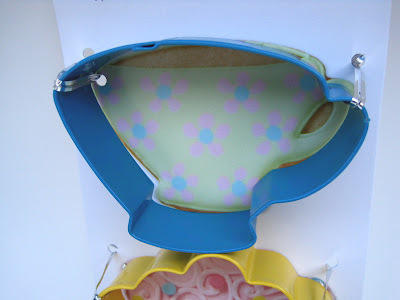 Any leftover butter from making tea sandwiches may be stored covered in the refrigerator for up to 5 days. 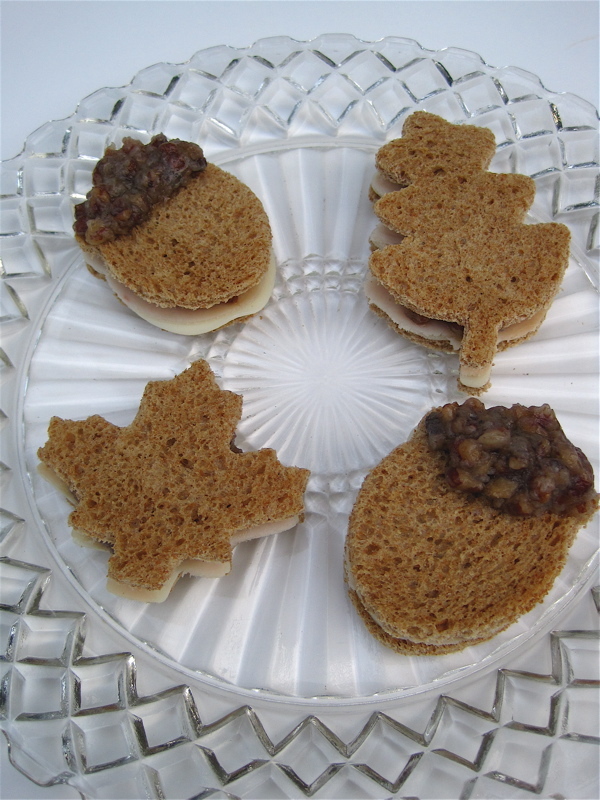 Trisha, by the way, said she found her inspiration for these sandwiches in an old fall issue of Tea Time. Looks like I need to go re-read some of my old issues! Guess identity of this teapot & win a prize! We haven't done anything really fun on this blog in a while, so today I thought we'd try a guessing game with a prize attached! To play, you just need to guess the identity of this brown rubber teapot-shaped item. I have no idea what the characters on the front say, so if they're Chinese curse words you'll just have to forgive me. Here's the other side. It's about 1-3/4 inches tall and 2-1/2 inches wide. 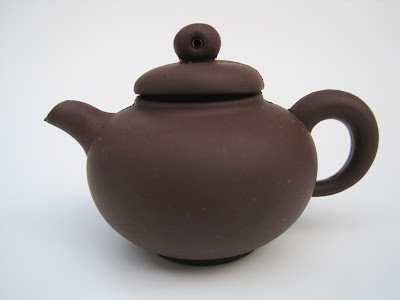 And it is functional, it's just not functional as a teapot! This photo is your third and final clue. If you take a guess, you'll be entered to win a $10 Starbucks gift card, and I'll announce the winner Monday morning. Just submit your best guess by 7 a.m. EST Monday and you'll be entered. Good luck! Quite without realizing it, this has been a week of tea tastings for me. 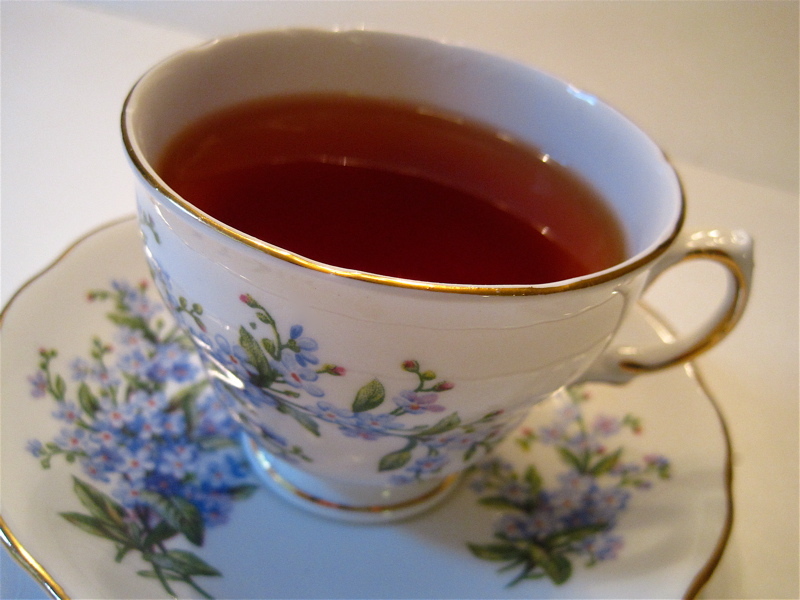 The latest cup is full of a new blueberry tea I'd never had before. 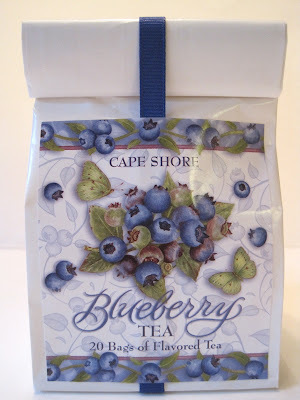 A friend who is from Maine brought me back this souvenir after a recent trip to her home state, and I must say this Cape Shore tea is the blueberriest of the blueberry teas I've tried yet. Absolutely fruity from first sip to last, and I loved it! 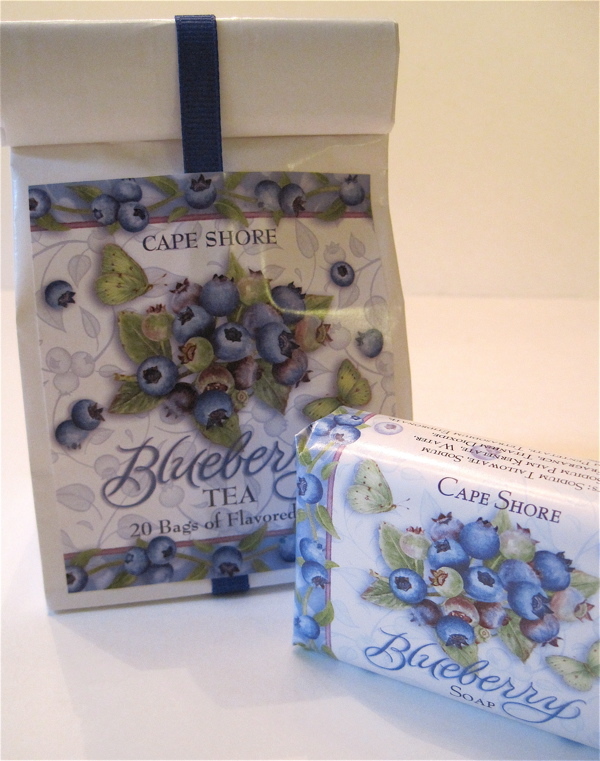 I also got some yummy blueberry soap. I am maine-ly very happy with both treats! Last week my friend (and co-worker) Deberah and I were doing some work in Atlanta and decided to have lunch at Whole Foods. 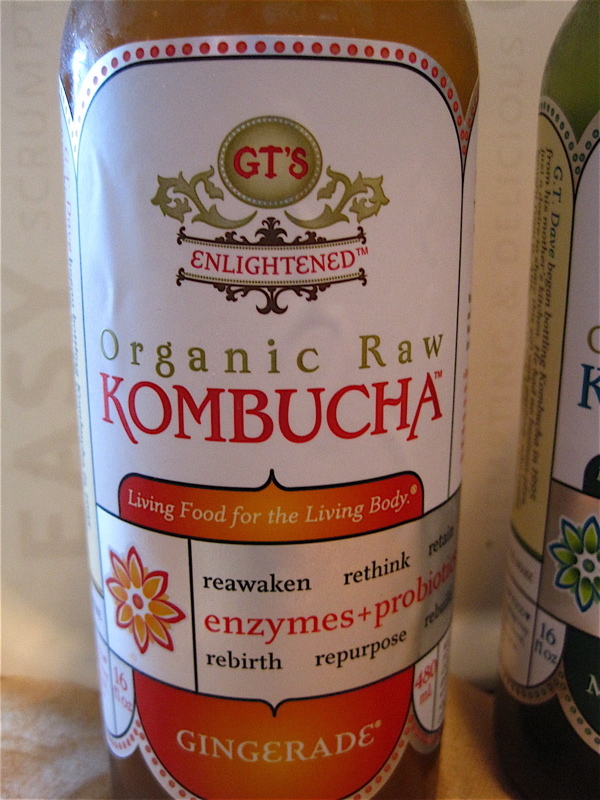 Now I've long known she was a fellow tea lover, but I was still surprised when we stopped by the case of refrigerated teas and she happily grabbed a bottle of Kombucha. 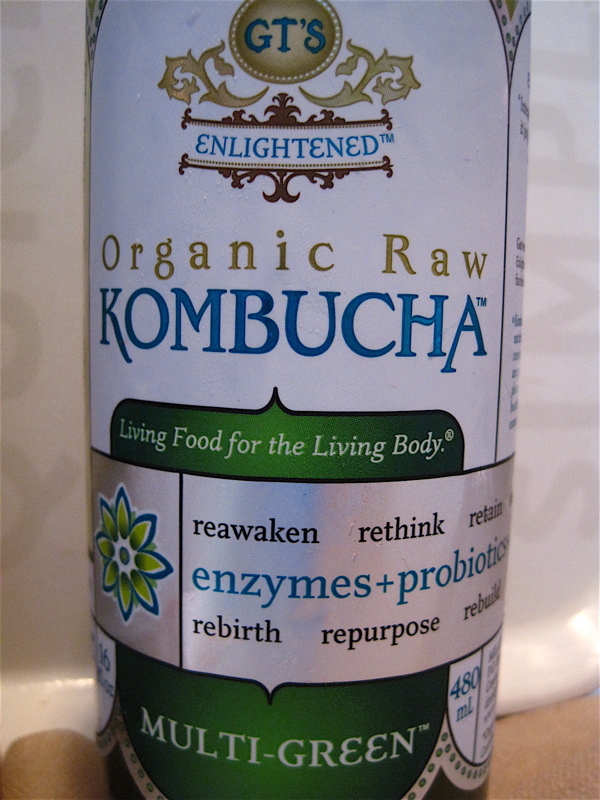 Kombucha? That's the fermented tea drink I had been wanting to try myself! So that's what we both got to drink with our lunch. On Deberah's recommendation I got the Gingerade flavor, and I *kind of* liked it. I really must qualify that because this is definitely going to be an acquired taste. "So what do you think?" she asked after I'd taken a drink. "I think ... I think it tastes like really, really good Texize!" I said, and she laughed. Actually, it was more like Alka-Seltzer and Texize with a bit of ginger, which I realize sounds horrid but somehow it works. Deberah let me try a sip of her Multi-Green Kombucha, and it tasted less industrial but I still liked mine better. So why drink Kombucha? Well, I got interested when I found this 1985 book on eBay last year, "Tea Fungus Kombucha: The Natural Remedy and its Significance in Cases of Cancer and other Metabolic Diseases." 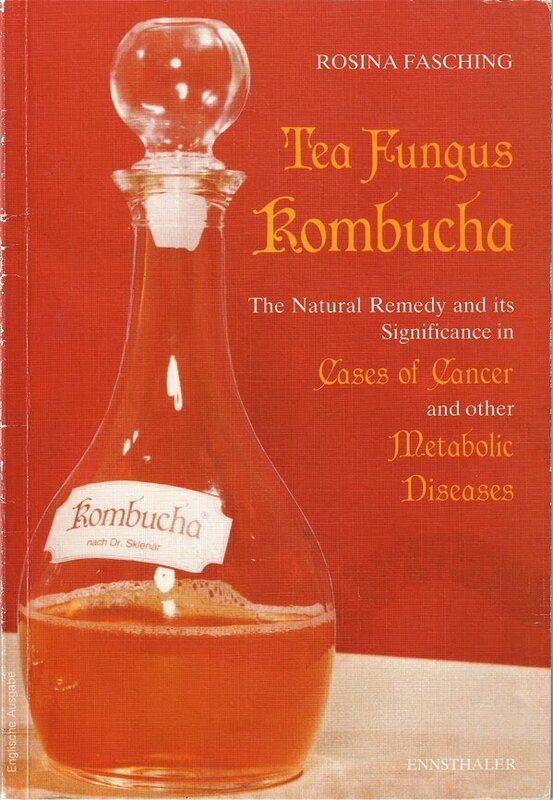 Turns out this was actually a book aimed at medical professionals, so much of it was way over my head, but I did enjoy reading the "success reports" at the end and learning about people who said this beverage helped them conquer various illnesses. 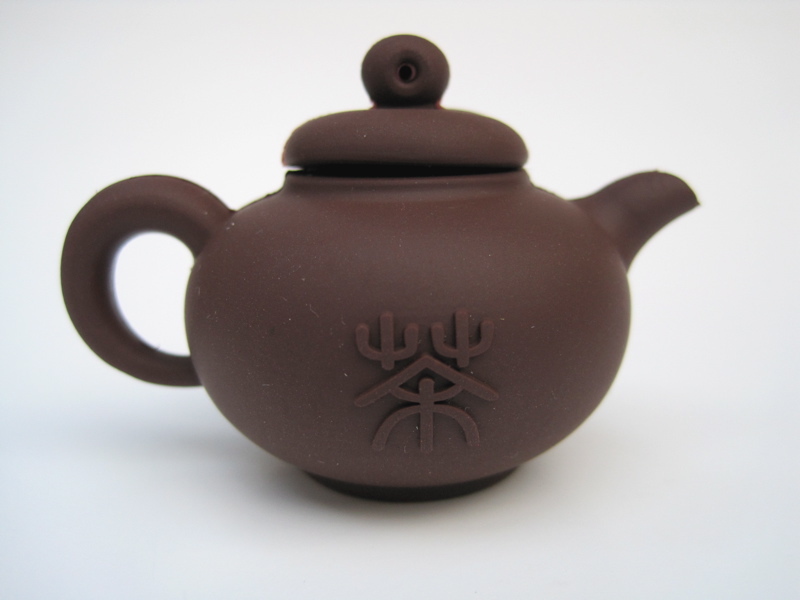 I am healthy at the moment and not looking to "cure" anything, but I am also a firm believer in the health properties of tea and am certainly keen to learn about new uses for tea. Apparently you can make your own Kombucha rather like you make a sourdough bread starter to keep on hand. I've got lots to learn about this fermented tea drink, though, before I try that! Are any of you Kombucha fans? 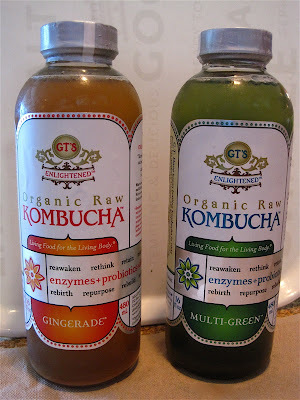 I'd dearly love to hear from the Kombucha drinkers! Here is a cup of Hazelnut Truffle Black Tea. The package describes it this way: "Rich dark chocolate enrobed with hints of hazelnut deliver a euphoric confectionary cup." Euphoric? Well, that may be taking it a bit far, but this *is* a really good hazelnut tea, one which manages to capture the complexity of the hazelnut's flavor, a distinct nutty taste you don't come across very often, especially not in a tea. And the tea leaf on the tea bag's tag is a nice touch, I thought. 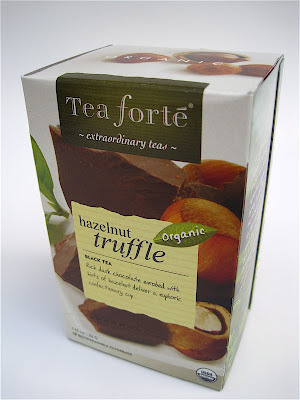 To my surprise, this tea is from Tea forté, whose teawares and fancy pyramid teabags I have enjoyed on occasion. I found these at a Whole Foods store in Atlanta. I don't believe I've ever seen Tea forté teabags packaged flat in teabag envelopes before. Have you? 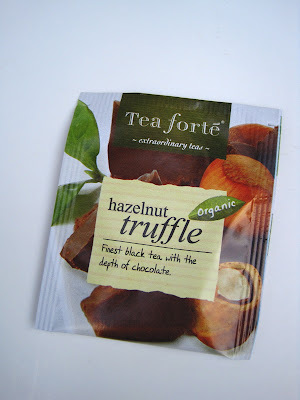 At any rate, I'm very much enjoying this as my new guilt-free dessert tea!